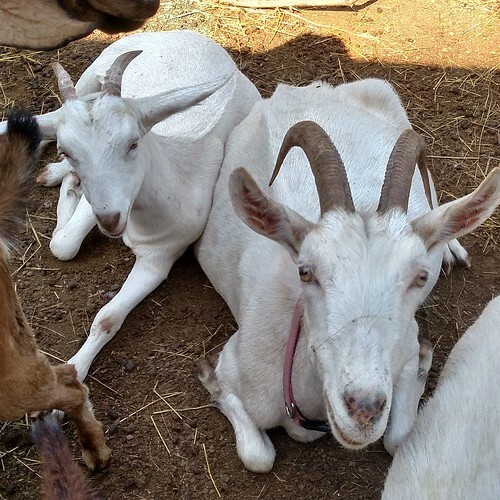 Last week my beloved Thea started getting violent with the other ruminants. Not in the usual way of a swing of the head or a light bump, but actively trying to harm the others, culminating in an earnest attempt to hurt or kill Ferrington. There’s a lot I can cope with, and scuffles for rank in the herd are not unusual, but this was something beyond the usual scuffles. So I made the difficult decision to place Thea in a new home, and sent Frankie with her so she’d have a buddy. I still feel like I need a good cry. I loved them both, and I can’t even stand to look at pictures of them right now. Luckily Gwyn has adapted to the loss of her mother just fine, because I think if she were crying I really would be, too. There’s a little bit of happiness, though, in that two potbelly pigs have come to stay and be working pigs to till the gardens and learn tricks. Apparently stressed pigs foam at the mouth. I did not know this. The pigs don’t have names yet (I need to consult with my animal naming crew on Patreon!) and need to lose some weight, but they’re settling in well and finding the shady places, food, and water. 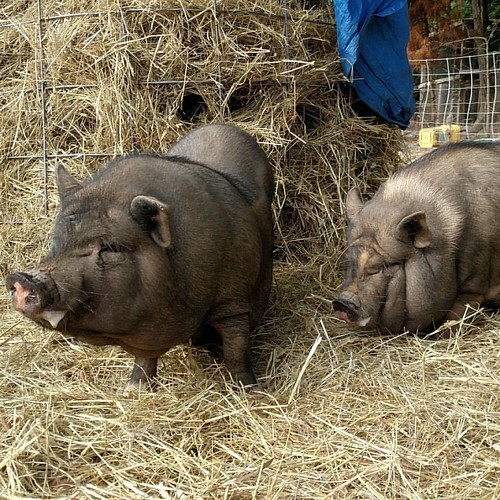 The solid black pig is a barrow, a male pig neutered before puberty. The one with white is a gilt, a female pig who has never had a litter of piglets. She may have one later (she’s only 8 months old) but for now they both need to lose some weight and settle in. Future piglets will be intended for food, but these two are here to be pets and garden tillers. The goats and sheep, by the way, are horrified. Life Stages: Gwyn, it’s time to stop nursing. Gwyn, Thea’s daughter, is around five months old. Left to their own devices, a doe will get pregnant again about now and wean the existing baby. But I’ve wethered my two bucks, and Thea shows absolutely zero signs of demanding that Gwyn stop nursing. More worryingly, Thea is scary thin, having poured all her reserves straight into her udder. And Gwyn is huge for her age, nearly as tall as Thea. Farmers with more land can round up kids (or lambs, or calves) and put them in a pasture separate from their mothers, where they can’t hear or see each other. I don’t have that much land, and having watched goats for a while I’d be loath to do it even if I did. 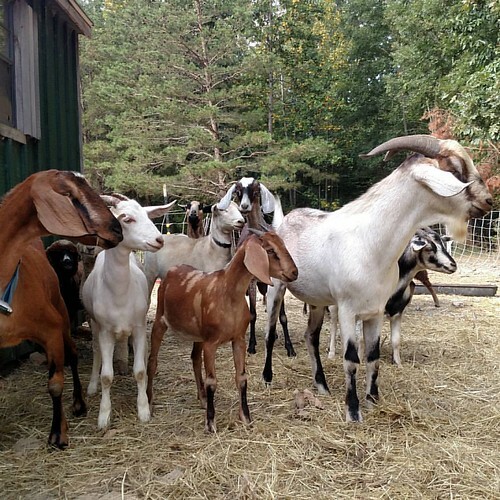 Sudden separation from the herd, even with a group of buddies their own age, is really hard on goats. It’s even harder for mother/daughter pairs, who in the wild would stay together their entire lives. The solution, in this case, was to put surgical tape over the orifices on Thea’s teats. Weirdly, the addition of tape seems to have caused Gwyn to lose the teats entirely — she acts like she just cannot find them. But day one went really well, the tape stayed on, Gwyn got to stay with her mother but didn’t nurse, and Thea was quite comfortable. This morning I milked her out and discovered Gwyn has been getting a half-gallon of milk per day. No wonder she’s huge and Thea is so skinny! I’ll be adjusting Thea to being milked once every other day, which should be sustainable for her while providing enough for humans to have milk and cheese. Meanwhile, not-so-little Gwyn is happy and Thea is happy and that makes me happy.